Manatees have a difficult time staying warm in cold water, due to their large size, slow movements and thin skin that lacks a protective layer of fat or ‘blubber’. So they rely on refuges where water temperature remains fairly constant during the winter, when sea water temperature goes below 68°F. This includes natural springs, thermal basins and power plants. A famous spring on Florida’s West Coast were female Forida manatees and their calf’s gather during the winter months is Three Sister Springs, It’s a true oasis of pristine ground water located in the heart of Crystal River, Forida and a favorite spot for snorkeling photographers and manatee lovers. The water temperature remains at a constant 72°F, an ideal setting for hundreds of manatees seeking shelter from the cold water of the Gulf of Mexico. 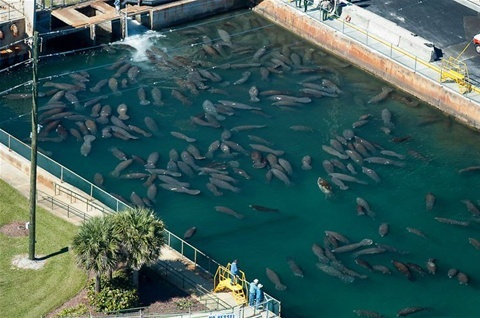 Another well known location at Florida's East Coast is a place near Blue Heron Bridge to Singer Island where warm water of the power plant creates a favorite spot for manatees in winters (see picture). This place has been a refuge for manatees since the 1940s. The inlet where the water that cools the plant is released into the Intracoastal Waterway keeps the water near the plant at about 90°F. The presence of dozens of manatees are a spectacle that for decades drew visitors to Florida Power & Light’s Riviera Beach power plant. Today was the opening of the new ‪#‎ManateeLagoon located across the Blue Heron Bridge from Singer Island. The new 16,000-square-foot, $4.8 million facility at 6000 N. Flagler Drive overlooks the Intracoastal Waterway. It includes exhibits, a second-story meeting space, a boardwalk, a manatee cam, a pavilion, a café and a gift shop.